This movement has been gaining momentum amongst environment conscious people who look for an alternative use of land that includes self sufficiency and sustainability. It is a halfway point between providing as much of your food needs as possible from your garden and foraging for food in the wild. The idea is to create a planting that imitates a natural forest system but is really a low maintenance, plant based food growing and agroforestry system incorporating fruit and nut trees, shrubs, herbs and vegetables. The initial projects were for communal land areas up to 5ha but such a system is easily adapted to a rural lot or part of a large urban garden. There are many gardens too large, or their owners too busy to manage large areas of vegetables and fruit trees. 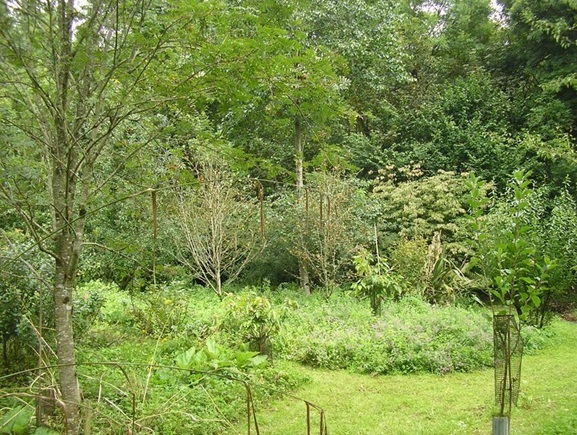 Food forests provide a food source combined with sustainable, eco-friendly principles together with low labour input. Everything in the system serves a purpose either to provide food, restore nitrogen or assist pest management. In the same way as a natural forest, a food forest is successional. Food forests are not natural but are designed and managed to provide a rich diversity that imitates the relationships found in a natural forest. As well as being productive, they provide food for beneficial insects, pollinators, birds and other wildlife. They are able to promote feelings of well being for their owners and as a safe playground for children. Plants change over a period of time. The area is first planted with a green manure crop such as mustard or oats and dug in. This can be followed by quick growing, fast cropping fruit bushes such as blackberry, currants and gooseberries. Following on, or at the same time, longer lived trees such as nuts, pip and stone fruits can be planted, which will become the upper storey or canopy. The plants chosen should be ‘heritage’ varieties that require less attention than the highly productive, high input varieties. The term ‘forest’ is used to indicate a degree of wildness. The plant species of each layer would vary with soil type and climate and can be adjusted to needs and locality. A food forest need not cover all available garden space but should be a useful, low maintenance addition to an already productive garden. In terms of garden planning, it would require less work and be placed at the extremities of the garden, leaving the frequently visited vegetable beds close to the house. Changing a grassed area needing constant time, energy and chemical input into a productive forest is more difficult than it appears. The long term rewards for all of us are great.